Yes, I know it’s summer, but my house smells like Fall! What’s better in fall you say? Apple Pie! Yes! My house smells like Apple Pie and here’s why – I’m dehydrating a bunch of apples today! Yummy!! A neighbor came over and when I opened the door she told me my house smelled amazing and she wondered what candle I had burning! 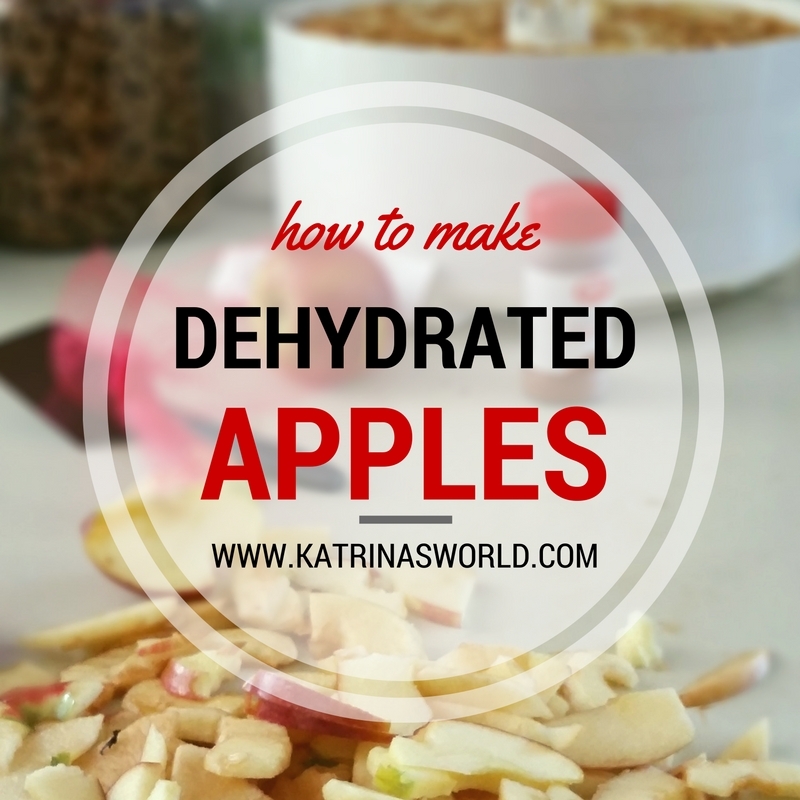 I told her I didn’t have a candle lit, but was making dehydrated apples – she was impressed! I’m not kidding, it really smells awesome and I can’t wait to make them this fall! They are so easy too – and I think they are even easier than the dehydrated bananas. I sort of feel like I’m a pro now at this (ya know, because I have dehydrated one batch of bananas and one batch of apples – – yep just pass me my pro status ribbon right now!) 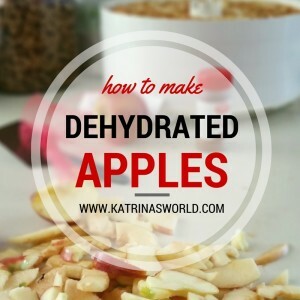 – so I have a few extra tips on how to make dehydrated apples quick and easy. For starters, my dehydrator only has 4 trays – so I can’t do a lot at the same time, but I did realize you can prep a whole bunch at once and save half the batch for later. If you have fewer trays like I do, then peel/slice/core your apples and place all the extra apples in a big bowl filled with a bit of water and lemon juice. Cover and store in your refrigerator until you are ready to dehydrate. I did one batch during the day (about 8 medium to large sized apples), and then cooked the second batch overnight. This totally happened by accident, I really had no idea how many apples my trays would fit so I ended up buying a 5 bags of 3 apples each on clearance at the grocery store and prepped all of them at once. :) Silly me! But I was happy to prep and save all the extras. It worked out great! One other tip, if you plan to do this a lot, then make sure you get an Apple Peeler/Slicer/Corer machine – I know Pampered Chef sells one, so does Williams and Sonoma (which is the brand I have – I’m lucky though, I found mine at Goodwill for $5). I tend to use mine a lot and it makes the whole process so much faster and super fun for your kids to help with! It’s messy and sticky, but a lot of fun! Peel, core, and slice the apples the same thickness so they dry evenly – 1/4″ is perfect. I used an Apple Peeler/Slicer/Corer. I picked mine up at Goodwill for $5 and I LOVE it! Makes peeling super fast and my kids love to help with it. Also, apples are sliced the same thickness which is helpful for drying. If you don’t have a Peeler/Slicer/Corer, you can do it manually. Lightly srapy your dehydrator trays with olive oil or PAM to help with sticking. Place apples in single layer on dehydrator trays. Spray apples with lemon juice from your small spray bottle to keep the apples from turning a yucky brown color. Lightly sprinkle cinnamon on the apples. Turn on the dehydrator and set to 135 degrees. Check apples in 5 hours and consider flipping over (again depends on the design of your dehydrator). Cook for a total of 10 hours until apples are no longer mushy to the touch. Store in an air-tight bag or container. Trust me, you will love how these make your house smell!! Yummy! Making these apples yourself is super healthy and such a great way to help stretch your grocery budget! My kids LOVE them and they are a super healthy snack for school! Win win!